6 or 7 Dylans? Oh no! What does it mean?! I saw the ‘biopic’ “I’m Not There” in a theatre when it came out, the imaginative retelling of the Bob Dylan story/mythology/sociological/cultural phenomenon. It kind of all went by in a blur. 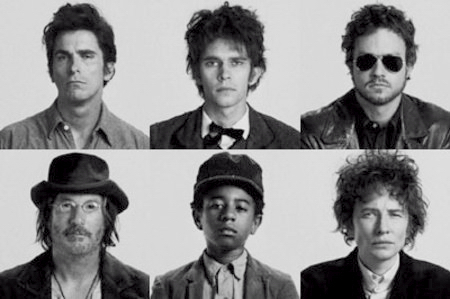 Dylan was portrayed by 6 different actors as 6 different seperate “characters”. I watched it again on DVD a couple of days ago, and got slightly more into it. Then I watched it again with director/co-writer/auteur Todd Haynes’ commentary. Wow! The sheer poetry of Dylan – and Haynes’ erudite study, astute and perceptive analysis – just blew me away. By the end of it I was bawling at the sheer inspiration and visceral connection I felt to the music; to Haynes’ vision and empathy; and to all that the music and story meant to people of my era – or anyone that’s ever been touched by it. I thought I knew a lot about Dylan (at least, beyond the mysteries of his art and genius.) Haynes’ commentary really revealed a lot to me, though. His commentary during the last two scenes and through the end credits might serve as a good introduction to anyone that is slightly baffled by the kaleidoscopic, impressionistic imagery of the movie. I was moved to transcribe Haynes summation over the end credits. I found it quite moving, inspiring, and a creative muse. If you’re a Dylan fan and haven’t checked it out; if you like the transcription; if you want to be inspired – it’s worth checking it out for yourself. All I can say is Amen! It’s good to hear a storyteller that knows what they’re on about! “I really wanted to talk about freedom from identity; and I think that’s really what Bob Dylan stands for; and that’s sort of what the ultimate message is to this film. “Tony Scaduto, who wrote one of the first biographies [of Dylan] said that he built a new identity every step of the way in order to escape identity. “In the final quotes from that great period where he was playing with structure – yesterday, today and tomorrow are all in the same room (from the “Blood On the Tracks” period.) Because I think all great works of art, philosophy, science start to challenge linear time and favor relativity, and that’s what Dylan was doing in his songs. And that’s what I tried to do in my movie. I mean, it was really an attempt to embrace what was radical about Dylan, what was experimental about Dylan. “The fact that it [Dylan’s music] remains so popular and drew an audience and drew the following of an entire generation doesn’t disprove how radical it was. The genuine weirdness of Dylan I think is something you can’t forget; and that’s really at the root of what he’s doing. [‘Weirdness’ relates back to what was said earlier about the weirdness of the cultural mix of America, itself.] But that’s where he’s combining high and low art – that’s where he’s made something beautiful out of the juke box, you know. And he’s never compromised; whether he’s failed or succeeded – he’s just done what he had to do, and I tried to do that in this film.